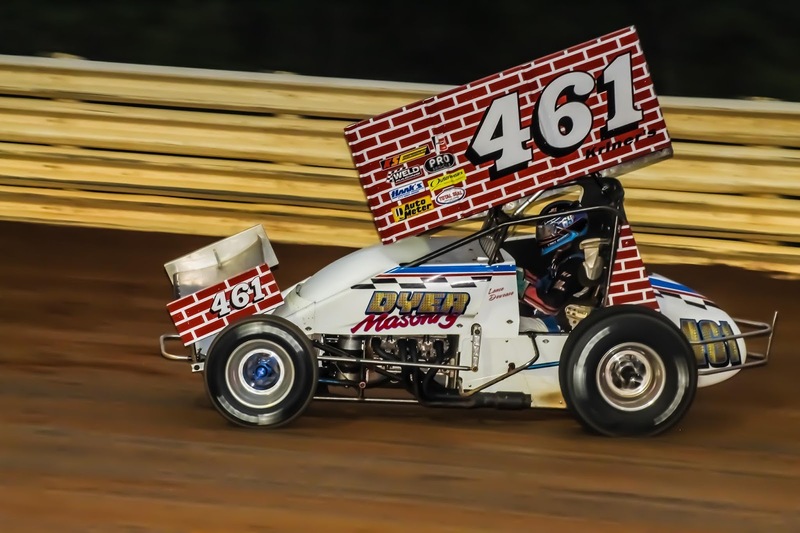 PORT ROYAL, Pa. – Lance Dewease of Fayetteville picked up his 109th career Port Royal Speedway 410 sprint car win on Saturday night in the Bob Weikert Memorial weekend Fallen Heroes Championship at Port Royal speedway. Dewease’s 30-lap win was worth $5,000 and it came aboard a Walt Dyer Masonry No. 461 throw-back car painted to mirror the mount he drove for Dyer decades ago. York’s Rick Eckert took the win in the Fallen Heroes Championship for the Northeast Ultimate Super Late Model Series, pocketing $3,000 for his fifth career win at the oval. Dewease started third in the sprint car field and would end up leading the first lap over David Gravel and Lucas Wolfe but not before exchanging the point twice. As Wolfe and Gravel battled for control into the first turn as the green flag unfurled Dewease was stalking on the low side and drove right by both cars to get command but Gravel rode the top lane to get control back as the pair shot onto the backstretch. Seconds later the trio blasted into the third turn and again Dewease stuck down low in his money lane and rode the line into the lead. The first caution flag of the race came out with two laps in when Logan Wagner clouted the outside first and second turn wall before coming to a stop. A double file restart saw Dewease choosing the inside line and he made it work over Gravel when action resumed. Dewease entered traffic with eight laps away finding Gravel and eighth starter Greg Hodnett in tow. The leader had a 3.930 second advantage when a red flag stopped action on the 13th tour after some hard contact in the first turn. Danny Dietrich was running seventh in the field when he got out of shape in the first corner and spun. Aaron Ott slammed into Dietrich’s mount and flipped, but escaped injury. Dylan Cisney was also involved. The restart again saw Dewease choose the inside lane with Gravel flanking him and he drove away on the restart and over the final 17 laps to record the popular victory by 4.307 seconds. It was his second consecutive victory in the Fallen Heroes Championship to open the Weikert Memorial weekend. Gravel was second followed by Greg Hodnett, Lucas Wolfe and Brock Zearfoss. Sixth through 10th went to TJ Stutts, Logan Schuchart, Brent Marks, Dylan Cisney and Trey Starks. Heats for the 30-car field went to Joey Hershey, Blane Heimbach, Dewease and Jacob Allen with AJ Flick taking the consolation..
Wolfe set quick time with a lap of 16.490 seconds. Eckert started second in the NUSLMS feature and took the lead over Jason Covert and Jeff Rine when action began. Covert and Rine battled for second for the first one-third of the race before Rine took the spot as the leader entered traffic on the 12th lap. A restart on the 17th lap saw Gary Stuhler work around Jeff Rine for second spot however Eckert was pulling away and he continued to do so to the finish. Eckert’s margin of victory was 4.766 seconds over Stuhler, Dylan Yoder, Jeff Rine and Donny Schatz. Sixth through 10th went to Jason Covert, Jared Miley, Dan Stone, Kyle Lee and Ross Robinson. Heats for the 34-car field went to Rine, Eckert, Covert and Stuhler with twin consolations going to Trent Brenneman and Chris Casner. Fast time over the late models was set by Covert with a lap of 19.609 seconds. PRS 2018 – Racing through a new decade with a new attitude!